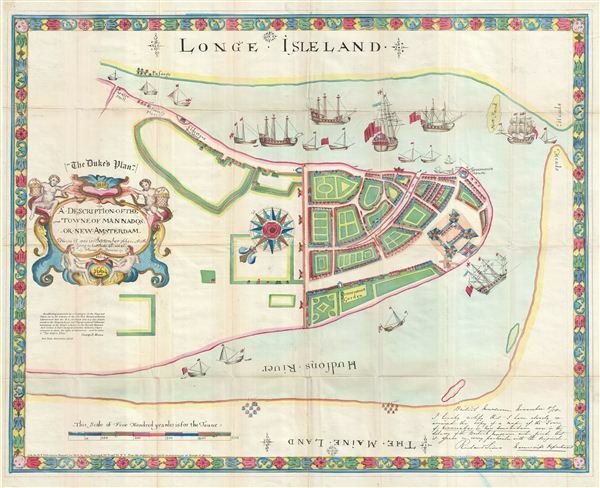 The first published representation of the Duke's Plan of New Amsterdam (New York), 1664. (The Duke's Plan.) A Description of the Towne of Mannados or New Amsterdam as it was in September 1661. This is the 1859 Valentine reissue of the magnificent 'Duke's Plan' of New York City. The original Duke's Plan, a fine illustrated manuscript prepared in 1664 currently resides in the British Library in London. The map was discovered in 1858 by George H. Moore, Librarian of the New York Historical Society after being all but forgotten on the stores of the British Library. Thus, this present example, published by Valentine in 1859, represents the first time this plan was revealed to the general public. Cartographically the map claims to represent the city in the year 1661, well before the 1664 British conquest. Two theories explain this. The first and most plausible suggests that the plan was based upon an earlier unpublished survey compiled during the Dutch period by Jacques Cortelyou - famous in his own right for the 1660 Castello Plan of New Amsterdam. The second, and most exciting, suggests that this map is actually the work of a British spy living in New Amsterdam under the Dutch. There is in fact a manuscript description of the city dating to 1661 that accurately corresponds to this map, however to produce this masterpiece, the rough sketches of the spy must have been reworked by the masters of the Thames School. The present example of this map was engraved by George Hayward from George H. Moore's manuscript facsimile and issued in the 1859 edition of D. T. Valentine's Manual. It is the first printed depiction of this beautiful and significant plan. David T. (Thomas) Valentine (1801 - 1869) served as the Clerk of the Common Council of New York City. He edited and published a series of New York City almanacs and fact books entitled Manual of the Corporation Of The City of New York. Valentine's Manual, as it came to be called, included facts about the City of New York, city council information, city history, and reported on the progress of public works such as Central Park. The production of this annual manual was the responsibility of the Clerk of the City of New York, a position held at different times by D. Valentine and by Joseph Shannon, who also produced a similar manual. Valentine used his manual to reproduce some of the rarest and most important maps of New York City ever created. Valentine, D. T., Valentine's Manual of the Corporation of the City of New York, (New York) 1868. Very good. Original fold lines visible. Professionally flattened and backed with archival tissue. Minor closed repair from left side into cartouche. New York Public Library, Map Division, MEZN++ Eno 6. Haskell, D., Manhattan Maps A Co-operative List, 63. Stokes, I. N. P., The Iconography of Manhattan Island, 1498-1909, pp. 207 -210. Augustyn, R. T., Cohen, P., Manhattan in Maps 1527 - 1995, 42-43.